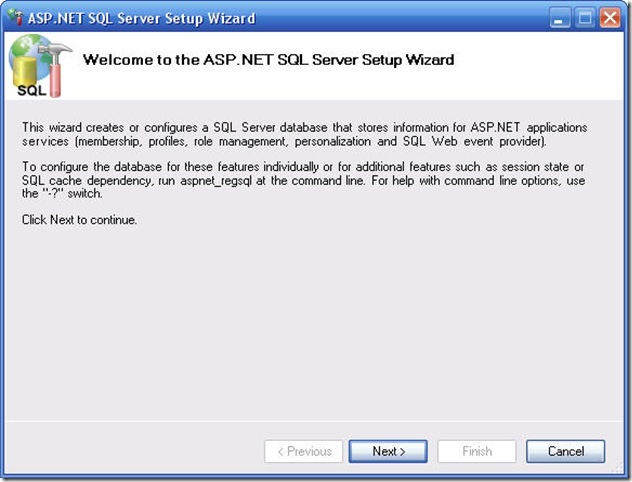 In this article i have briefly discussed ASP.Net SQL Server Membership database installation on SQL Server 2008 Express. Run aspnet_regsql.exe utility from C:\windows\Microsoft.NET\Framework\v2.0.50727 folder on your machine. 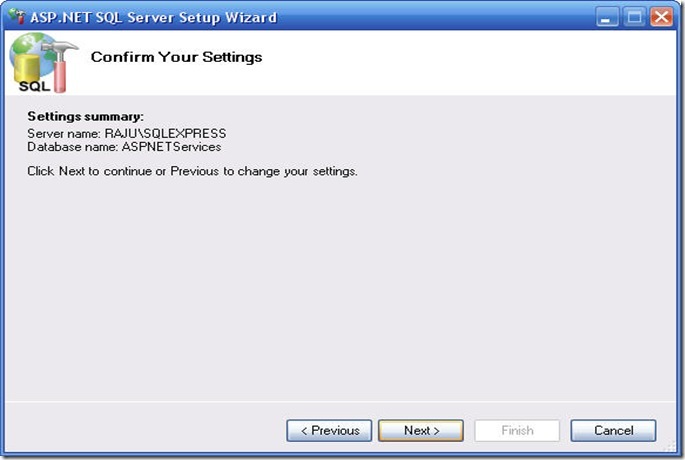 Selecting or double clicking the aspnet_regsql.exe utility opens the wizard as below. 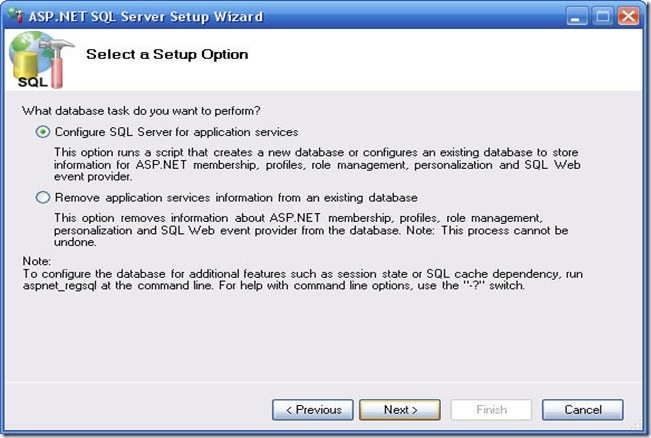 Selecting Next button on above window opens next window where you can either configure SQL Server for Application services or remove Application services information from an existing database. 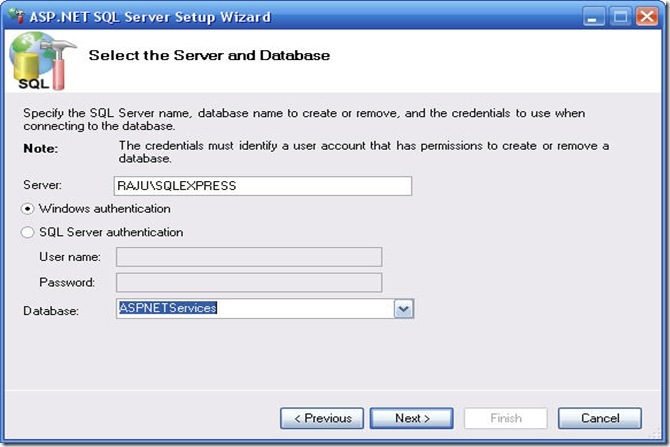 Select configure SQL Server for application services radio button to install new database and select Next button. 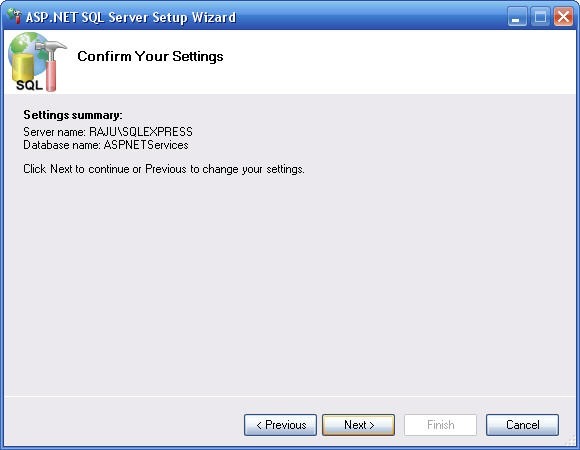 Enter your SQL Express server name as <your Machine name \SQL Express> as shown below. 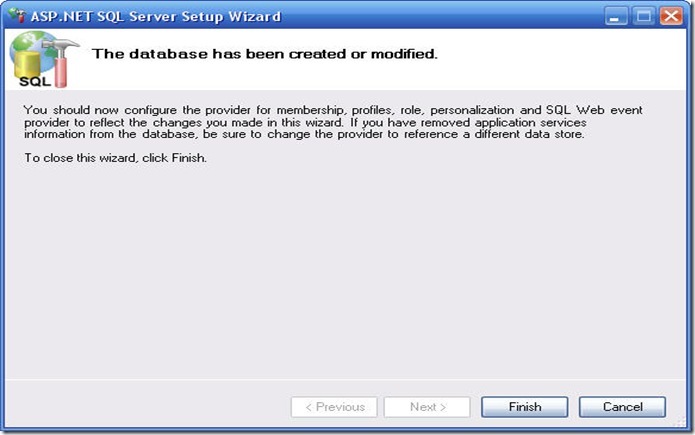 Note that you can change the application services database name to your desired name (aspnetdb by default). Select Next button and confirm that your settings are correct to go further with installation (shown in below image) and select Next button. 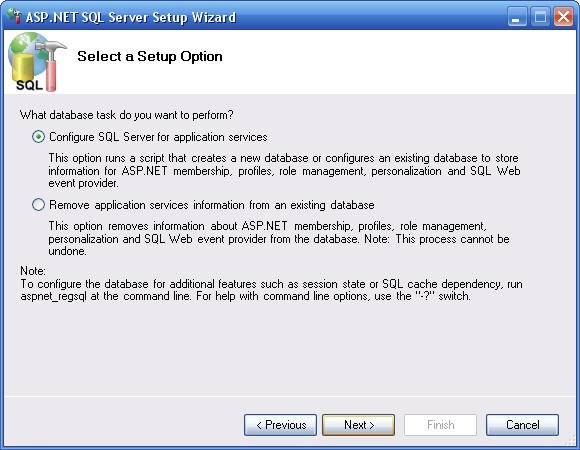 Selecting Next button on above window takes you to confirmation window as below after successful installation of your application services database for ASP.NET. I know now how to generate my security tables in a DB other than ASPNETDB. Thanks Raju. Great post. AS the exception says 'there is problem with your SQL Server connection string'. 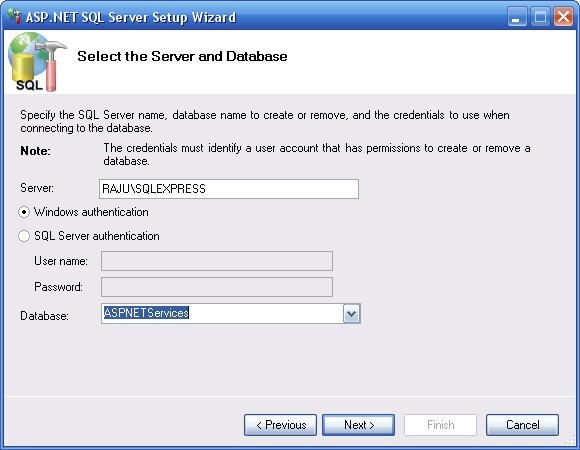 Make sure that you can connect to SQL Server using SQL Server Management by choosing SQL Server authentication using the same USERNAME and PASSWORD that are used in Web.config connectionStrings section. Make sure that the same User account has permission on Membership databse. Can I use this to connect to SQL Server standard (NOT Express)? 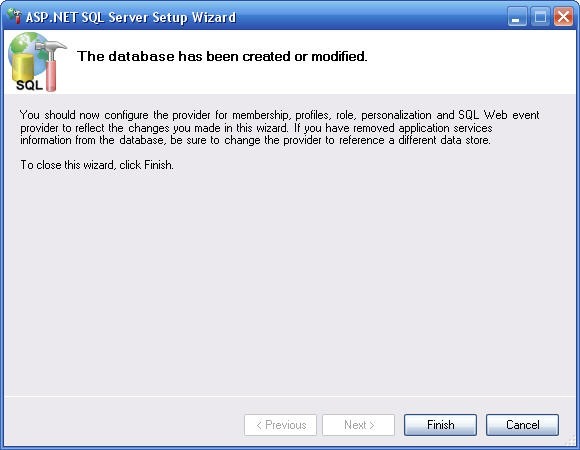 I don't want to use the .mdf file, but rather use an existing SQL Server database. Is that possible? 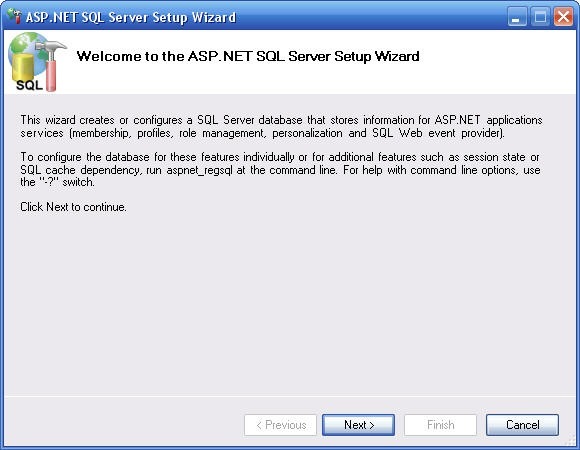 Yes it is feasible to install ASP.NET Membership database in SQL Server standard existing database. Thanks for pointing that issue, I update this article with that info. Thanks Raju for the useful post. Worked great! 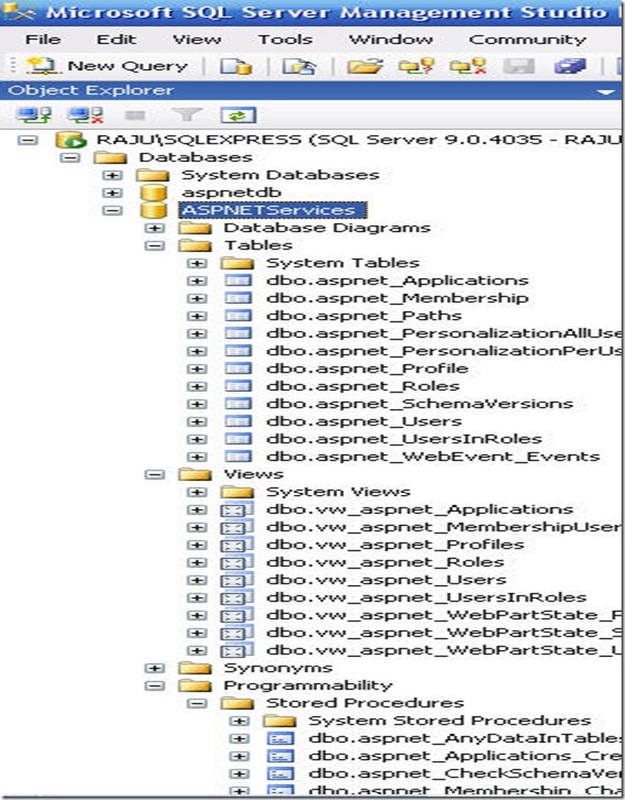 Thanks Raju, I never knew you could install the security files into an existing database. Great help! Thanks, your guide really effective. Thanks,worked perfectly for me too!